11 o’clock two nights ago, Avenida Danças, Ipiranga. At 11:20, a large number of people were already coming in to watch the launch of “Tropicália” and to be at the top tropicalist happening ever since the movement was invented. The first ones to arrive were Gilberto Gil, Gal Costa, Os Mutantes, Nara Leão, Tom Zé and the businessman Guilherme Araújo, producer of the party, Caetano arrived later and, as he walked in, was received with applause and shouting. The floor was divided in two. On one side, regular customers went on dancing mindless of what was going on on the other side, where the many tables arranged weren’t enough to sit the number of people present. Gil, at a large table, with Nara Leão and Rhodia dancers, honked a horn and shouted out, “Terezinha”, mimicking famous TV host Chacrinha. Everyone shouted back: “Tereziiiiinha”. The members of the “New Vaudeville Band” arrived: seven Englishmen dressed in 1920’s style. The “Beat Boys”, long beards and Che Guevara berets, also walked around the crowd of fashion models, dancers, artists, journalists, unknown people, photographers, etc. Caetano wore a jacket bought in London and a pink boa, a sort of scarf, wrapped around his neck. Caetano and Gil walked around the floor, saying hello to everyone. At one, the impeccably dressed official hosts of Avenida Danças, announced the show. No one could hear what they were saying, because of the noise and everyone shouting “Terezinha”. One group kept calling poet Décio Pignatari, who was sitting a small distance from the mob. The curtain opened and people started shouting for the others to sit down. Gilberto Gil started the show with Miserere Nobis. There was some silence when Caetano sang Coração Materno. During the other songs, the public sang along and clapped their hands. 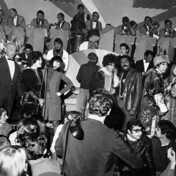 Onstage were Nara, Gil, Caetano, Gal Costa, Os Mutantes, Tom Zé. One by one, all the songs from the record were presented: Miserere Nobis, Coração Materno, Parque Industrial, Panis et Circensis, Hino ao Senhor do Bonfim da Bahia, Baby, Lindonéia Três Caravelas, Bat Macumba, etc. When they presented the hymn Hino ao Senhor do Bonfim da Bahia, actor Antonio Pitanga saluted Our Lord of Bonfim, as they do in processions. At the peak of enthusiasm, all the artists sang Macumba. The excellent house orchestra was conducted by Rogério Duprat. When the show was over, Jorge Ben showed up and got onstage with the others. Everyone was singing and dancing. Other artists applauded too: Claudete Soares, De Kalafe, Valmor Chagas, Rejane Medeiros and others. Gil and Caetano got off the stage and hugged everyone around them. Avenida Danças had a very lively “social” evening, but the revenue wasn’t all that great. Many customers had left the dance floor to check out a real tropicalist night up-close.